This is an oven baked version that tastes very fried-chicken like, with a crispy finish that stays that way for a while even when cold. I've given them a spicy-savory-sweet flavor; the spice comes from gochujang, a miso-like Korean chili pepper paste that I have a serious crush on. (See my previous recipe using gochujang.) They are of course, perfect for bentos. I'd suggest having some for dinner and setting aside some for bentos. You may have to hide the ones set aside from midnight fridge raiders though. Oven baked spicy Asian flavored chicken wings that are great hot or cold. Cut the chicken wings apart into 3 sections (see how-to on this page; you don't have to turn them into lollipops though, just cut the joints apart.) Keep the tips for making soup. 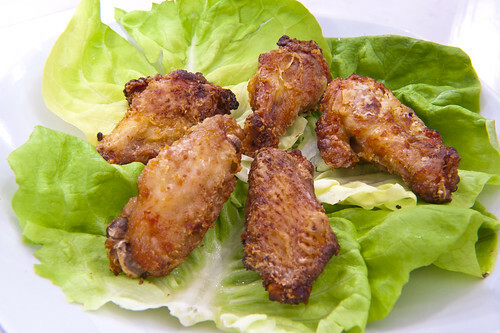 Cut small slits along the bone of the chicken wings. This helps the marinade to penetrate better. Combine the soy sauce, sake, sesame oil, grated ginger and garlic, sugar and gochujang in a plastic zip bag, and add the chicken wings. Close the bag and massage it with your hands to let the flavors penetrate the chicken. Leave the bag in the refrigerator for at least 1 hour (you can do it overnight), turning the bag over occasionally. I recommend putting the bag on a plate or something just in case it leaks. When you're ready to cook them, preheat the oven to 200°C / about 390°F. Line a baking sheet with kitchen parchment paper or aluminum foil. Spread a little vegetable oil on top. Take the chicken wings out of the marinade and pat them dry with paper towels to remove excess marinade. Put some cornstarch or potato starch in another zip bag, and put in the chicken wings. Shake them around to coat thoroughly, then massage them a bit over the bag to really stick the starch onto the surface. Take the wings out of the bag, shaking off any excess flour. Line them up on the baking sheet with the side with more skin on it down, taking care not to let them overlap. Drizzle a little bit of oil (you can use vegetable oil or sesame oil) over the wings and turn them to ooat in the oil. Bake for about 20 to 25 minutes, turning them once. They should be golden brown and pretty crispy. Drain off any excess oil by letting them rest a bit on a rack or paper towels. If you don't have sake substitute dry sherry or even white wine. If you can't do alcohol use unsweetened apple juice instead, but it will have a different flavor. Use just 1/2 tablespoon of sugar if using apple juice. If you really like spicy, serve with a dollop of gochujang on the side to smear onto the wings. The wings will last for a couple of days in the refrigerator, and up to a month frozen. They will lose the crispiness over time, but you can re-crisp them by putting them in a preheated oven for a few minutes. They taste nice even if they aren't crisp though. Thu, 2013-05-02 11:58 by Jessica A.
I love gochujang too! Think I'm going to try this for my bento on Monday but I'll probably use boneless chicken thighs instead which is more convenient to eat. Thu, 2013-05-02 13:57 by anon. Looks great! I plan to return to the Lotte soon - I'll see if I can find gochujang. It sounds like it would be a versatile sauce for a lot of different things. Those chicken wing tips are also good for cats. Raw is fine. The cartlidge is good for cleaning their teeth and most love the treat. Any other suggestions for what to do with those wingtips would be appreciated. I put mine in the refrigerator for a week in a nice container from Muji, and they went bad and gave the container an evil smell. I have it sitting encased in baking powder now. But the wings were super! I'm doing them again this week mostly for bentos. You know what really rules about this recipe? The fact that you posted how long they keep in the fridge and freezer. Thank you so much for doing that! So many times I have left overs and I have no idea what to do! Thank you thank you thank you!! !